This is the first of several OpenGL rendering performance tests done to determine the best strategy for rendering of various type of procedural and non-procedural content. This particular test concerns with rendering of small procedurally generated meshes and the optimal way to render them to achieve the highest triangle throughput on different hardware. This test generates lots of geometry from little input data, which might be considered a distinctive property of procedural rendering. 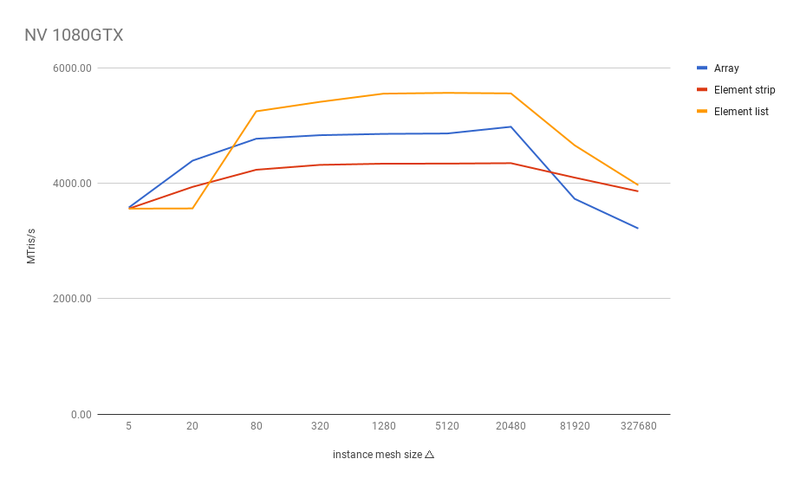 Goals of the test are to determine the fastest rendering method for procedural geometry across different graphics cards and architectures, the optimal mesh size per (internal) draw call, the achievable triangle throughput and factors that affect it. 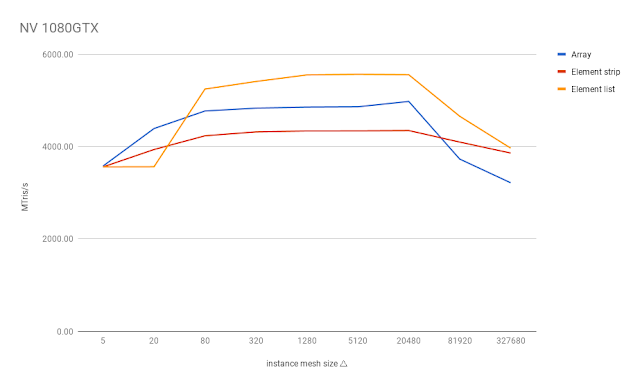 On Nvidia GPUs and on older AMD chips (1st gen GCN and earlier) it’s good to keep mesh size above 80 triangles in order not to lose performance significantly. 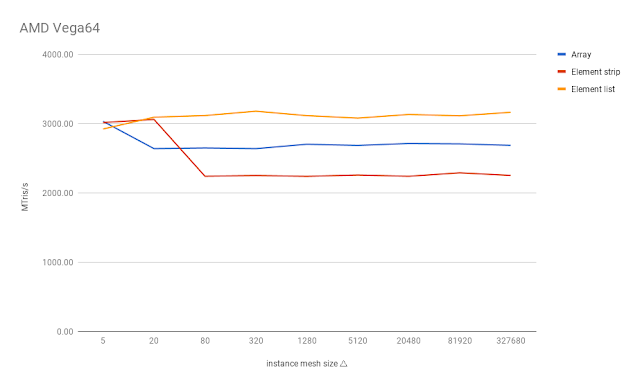 On newer AMD chips the threshold seems to be much higher - above 1k, and after 20k the performance goes down again. Unfortunately I haven’t got a Fury card here to test if this holds for the latest parts, but anyone can run the tests and submit the results to us (links at the end). In any case, mesh size around 5k triangles is a good one that works well across different GPUs. Interestingly both vendors start to have issues at different ends - on Nvidia, performance drops with small meshes/lots of instances (increasing CPU side overhead), whereas AMD cards start having problem with larger meshes (but not with array rendering). Conclusion: with small meshes, always group several instances into one draw call so that resulting effective mesh size is around 1 - 20k. Geometry shader performance roughly corresponds to the performance of instanced vertex shader rendering with small instance mesh sizes, which in all cases lie below the peak performance. This also shows as a problem on newer AMD cards with disproportionally low performance with geometry shaders. Note that there’s one factor that can still shift the disadvantage in some cases - the ability to implement culling as a fast discard in GS, especially in this test where lots of off-screen geometry can be discarded. GS performance is also affected by the number of interpolants (0 or 4 floats in the graph), but mainly on Nvidia cards. 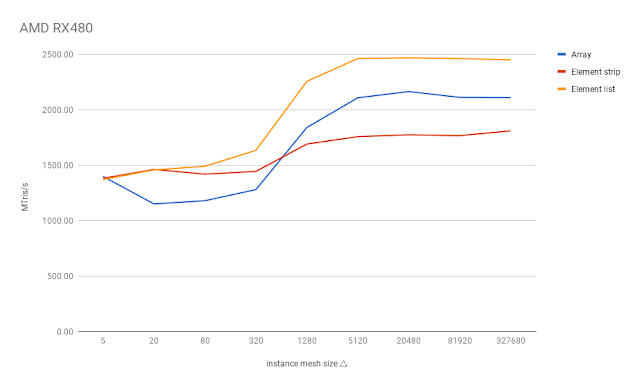 The following graph shows the performance as a percentage of given card’s theoretical peak Mtris/s performance (core clock * triangles per clock of given architecture). However, the resulting numbers for AMD cards seem to be too low. Perhaps a better comparison is the performance per dollar graph that follows after this one. 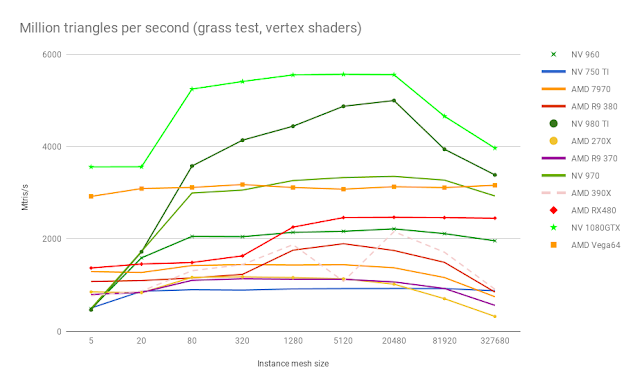 Arrays are generally slower here because of 2 extra vertices needed to cross between grass blades in triangle strips, and only match the indexed rendering when using per-blade instances, where the extra vertices aren’t needed. “Randomized” versions just reverse the bits in computed blade index to ensure that blade positions are spread. This seems to help a bit on older architectures. Slower rendering on Nvidia with small meshes is due to sudden CPU-side overhead. There are 3 tests: grass, buildings and cubes. The tests can be launched by running their respective bat files. Each test run lasts around 4-5 seconds, but there are many tested combinations so the total time is up to 15 minutes. 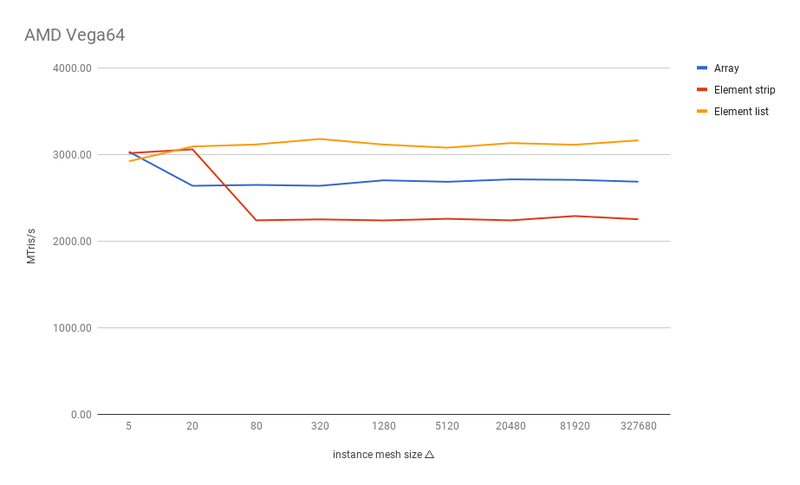 The other two tests will be described in subsequent blog posts.